I’ve always dreamed of growing up and having my own website, (most of my ideas were probably considered First-Generation, which I will explain a little later). Now I am almost 17 and I’m just starting to create one, with the help of my mentor, Evan. My website, as of now, is mainly a place where I can keep and present my portfolio. I’m still learning how to use WordPress, the “website creator”, or the “backend” of website creation. Without Evan’s help, I wouldn’t know where to begin in designing (or creating!) a website. 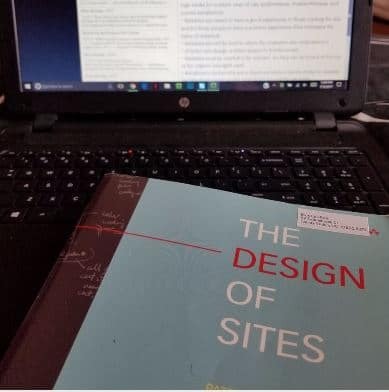 The book, The Design of Sites is also helpful in learning about how websites are designed. Inside, the authors explain how to properly create your site, how they work, and the steps to achieve a good website. The Design of Sites also goes into depth about what it means to own a website. Not many people realize that to have a good website, you have to work to make it. The perfect website will not appear in your dreams nor will it show up if you just look at your computer screen for hours. In order to achieve this, you must update your website regularly to attract more customers visiting it. This can be executed by writing at a 5th-grade reading level. You must be wondering… “Why 5th grade? Isn’t that a little young?”, well, there is a reason. Many choose to write at this level so they give everyone a chance to be able to read and understand what the page or post is saying. The easier it is to read, the more likely people will continue to return to your site. When websites first became “a thing”, people went crazy! Anyone and everyone was trying to create an unnecessary website, this is considered First-Generation. People created an irrelevant website about something random and people still visited their site. These websites usually had nothing to do with anything, people just wanted to have a website. Now fast forward to present time, we are now in the Third-Generation, where building websites are meant to be of actual value and have a meaning to be created. Although there are still going to be those few stragglers that will create a website to be funny and there’s nothing anyone can do to stop them. There are many different varieties of website design: user-centered, company centered, technology-centered, and designer centered. All of these are the different ways for a website layout. For example, if you are a user-centered business, you are most likely selling some kind of product so the layout/functionality of your website would be different that one that is designer centered, where it is most likely a portfolio type website. No matter the case or the business, learning at least the basics of website creation can be very helpful.